and this is the specter our well meaning liberal friends refuse to face"
Four Americans, were murdered in the attack. Ambassador Christopher Stevens first Ambassador to be killed since 1979, Information Officer, Sean Smith, along with Former Seals and private security contractors Glen Doherty and Tyrone Woods. The following morning the Obama Administration announced unbelievably to the world that these men were murdered because of an obscure YouTube about the prophet Mohammad. Ambassador Rice stated on CBS’s Face the Nation: "Based on the best information we have to date … it began spontaneously in Benghazi as a reaction to what had transpired some hours earlier in Cairo, where, of course, as you know, there was a violent protest outside of our embassy sparked by this hateful video. 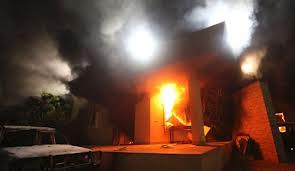 But soon after that spontaneous protest began outside of our consulate in Benghazi, we believe that it looks like extremist elements, individuals, joined in that effort with heavy weapons of the sort that are, unfortunately, readily now available in Libya post-revolution. And that it spun from there into something much, much more violent. … We do not have information at present that leads us to conclude that this was premeditated or preplanned." One month and four days later a very different true story has come to light. This was NEVER a demonstration that went horribly wrong. It was an act of War against United States Sovereign Territory in Libya. On September the 15th, 2012 Obama and Hillary Clinton at a Ceremony for Ambassador Stevens, Sean Smith, Glen Doherty and Tyronne Woods bodies were returned home both President Obama and Secretary of State callously lied to grieving family members and America about how these abandoned men died. What a despicable calculated affront. For nearly a month the Obama Administration held onto their narrative about the YouTube. They repeatedly persisted in claiming that what the United States witnessed in over 20 Arab nations the demonstrations which raged at our Embassies were sparked by the obscure YouTube. I was not alone when I did not believe this. I like many Americans knew instinctively this was an act of terrorism. On October the 5th, Jake Tapper ABC reported he had received an internal State Department email exposing that the Department of State had rejected the request from the Security Team for the consulate in Libya for a DC3. On October the 7th Human events reported in a bombshell that a 16 member Special Forces team had been removed from Libya. On October the 10th The House Committee on Oversight and Government Reform held a hearing in the Capitol which totally exposed the falsehood of statements by President Obama during his speech at the UN, comments of Secretary of State Hillary Clinton, Ambassador Susan Rice, and countless other Obama Administration officials and Pundits of the left. The sworn and damning text of Eric Allen Nordstrom's testimony can be found here, along with the text of the testimony of Lieutenant Colonel Andrew Wood. When you watched and listened to Deputy Assistant Secretary of State Charlene Lamb's incredulous testimony if you felt like your head would explode with one after another of her assertions of the safety of the Consulate in Benghazi you are not alone. I did too! It was clear when you listened to Undersecretary of State Patrick Kennedy he appeared less than candid. Congressman Trey Gowdy, SC voiced my contempt and I believe most of America's Contempt. If you were angry before the hearings, you were more than outraged by the time the Committee adjourned. On October the 9th The Department of State held a Conference call with many news agencies and excluded Fox news from the call. The Conference call is a chilling account of the time line of the Benghazi Terror attack. OPERATOR: Ladies and gentlemen, thank you for standing by. Welcome to the State Department call on Libya. At this time, all participants are in a listen-only mode. Later, we will conduct a question-and-answer session. Instructions will be given at that time. Should you require any assistance during the call, please press *, then 0. I’d now like to turn the conference over to your host, [Moderator]. Please go ahead. MODERATOR: Hey, everybody. Thanks for joining us on such relatively short notice, late on a Tuesday evening. You know that since the beginning, we’ve been working with Congress on trying to ascertain the facts and convey the facts of what happened on 9/11 in Benghazi. In the last 24 hours and in the next 24 hours, we’re going to be engaging with Congress, and we wanted to give you a sense, in the press, of what we’ve been telling them. So joining us tonight are two Senior State Department Officials, and this will be on background, and they will be Senior State Department Official Number One, who is [Senior State Department Official Number One]; and Senior State Department Official Number Two, [Senior State Department Official Number Two]. So in any case, thank you for joining us, and I’m going to hand it over to Senior State Department Official Number One. And just a reminder before I do, again, this is on background. Thank you. SENIOR STATE DEPARTMENT OFFICIAL NUMBER ONE: All right. Let me proceed. I’m going to give you as much information as possible about the events of that night, but I am going to start with a scene-setter. So let me set the stage. On April 5th, 2011, a small Department of State team headed by Chris Stevens arrives by chartered boat in Benghazi. They set up shop in a hotel. This is at a time when Benghazi was liberated, Quaddafi was still in power in Tripoli, the war was going on, our Ambassador had been expelled from Tripoli by Qaddafi, the Embassy staff had been evacuated because it was unsafe. So Chris Stevens coming back into Benghazi – coming into Benghazi on April 5th, 2011, is the only U.S. Government people in Libya at this time. They set up shop in a hotel, as I mentioned. A few weeks later in June, a bomb explodes in the parking lot in front of the hotel. The group in Benghazi makes a decision to move to a new location. They move to a couple of places, and by August they settle on a large compound which is where the actual activity on 9/11 took place. So they’re in a large compound, where they remain. The compound is roughly 300 yards long – that’s three football fields long – and a hundred yards wide. We need that much room to provide the best possible setback against car bombs. Over the next few months, physical security at the compound is strengthened. The outer wall is upgraded, its height is increased to nine feet.It is topped by three feet of barbed wire and concertina wire all around the huge property. External lighting is increased. Jersey barriers, which are big concrete blocks, are installed outside and inside the gate. Steel drop bars are added at the gates to control vehicle access and to provide some anti-ram protection. The buildings on the compound itself were strengthened. The compound has four buildings on it, and you guys are going to have to get used to this, because I refer them to – as Building C, Building B, Tactical Operations Center, and a barracks. So Building C is a building that is essentially a large residence. It has numerous bedrooms and it is – it has a safe haven installed in it, and I’ll talk more about that in a minute. Building C ultimately is the building that the Ambassador was in, so keep that in your heads. Building B is another residence on the compound. It has bedrooms and it has a cantina. That’s where the folks dine. The Tactical Operations Center, which is just across the way from Building B, has offices and a bedroom. That’s where the security officers had their main setup, that’s where the security cameras are, a lot of the phones – it’s basically their operations center. So I’ll call it the TOC from now on. And then there was a barracks. The barracks is a small house by the front gate, the main gate of the compound. In that barracks is a Libyan security force which I’ll describe in a minute. Security on the compound consists of five Diplomatic Security special agents and four members of the Libyan Government security force, which I will henceforth call the 17th February Brigade. It is a militia, a friendly militia, which has basically been deputized by the Libyan Government to serve as our security, our host government security. In addition to all those, there is an additional security force at another U.S. compound two kilometers away. It serves as a rapid reaction force, a quick reaction security team – a quick reaction security team, okay? Now we’re on the day of, and before I go into this discussion of the day of the events of 9/11, I’m going to be – I want to be clear to you all. I am giving you this – you my best shot on this one. I am giving you what I know. I am giving it to you in as much granularity as I possibly can. This is still, however, under investigation. There are other facts to be known, but I think I’m going to be able to give you quite a lot, as far as I know it. I have talked to the – to almost all the agents that were involved, as well as other people. Okay. The Ambassador has arrived in Benghazi on the 10th of September. He does meetings both on the compound and off the compound on that day, spends the night. The next day is 9/11. He has all his – because it is 9/11, out of prudence, he has all his meetings on the compound. He receives a succession of visitors during the day. About 7:30 in the evening, he has his last meeting. It is with a Turkish diplomat. And at – when the meeting is over, at 8:30 – he has all these meetings, by the way, in what I call Building C – when the meeting is over, he escorts the Turkish diplomat to the main gate. There is an agent there with them. They say goodbye. They’re out in a street in front of the compound. Everything is calm at 8:30 p.m. There’s nothing unusual. There has been nothing unusual during the day at all outside. After he sees the Turkish diplomat off, the Ambassador returns to Building C, where the information management officer – his name is Sean Smith, and who is one of the victims – the information management officer – I’ll just call him Sean from now on, on this call – and four other – four Diplomatic Security agents are all at Building C. One Diplomatic Security agent is in the TOC, the Tactical Operations Center. All of these agents have their side arms. A few minutes later – we’re talking about 9 o’clock at night – the Ambassador retires to his room, the others are still at Building C, and the one agent in the TOC. At 9:40 p.m., the agent in the TOC and the agents in Building C hear loud noises coming from the front gate. They also hear gunfire and an explosion. The agent in the TOC looks at his cameras – these are cameras that have pictures of the perimeter – and the camera on the main gate reveals a large number of people – a large number of men, armed men, flowing into the compound. One special agent immediately goes to get the Ambassador in his bedroom and gets Sean, and the three of them enter the safe haven inside the building. And I should break for a second and describe what a safe haven is. A safe haven is a fortified area within a building. This particular safe haven has a very heavy metal grill on it with several locks on it. It essentially divides the one – the single floor of that building in half, and half the floor is the safe haven, the bedroom half. Also in the safe haven is a central sort of closet area where people can take refuge where there are no windows around. In that safe haven are medical supplies, water, and such things. All the windows to that area of the building have all been grilled. A couple of them have grills that can be open from the inside so people inside can get out, but they can’t be – obviously can’t be opened from the outside. The agent with the Ambassador in the safe haven has – in addition to his side arm, has his long gun, or I should say – it’s an M4 submachine gun, standard issue. The other agents who have heard the noise in the – at the front gate run to Building B or the TOC – they run to both, two of them to Building B, one to the TOC – to get their long guns and other kit. By kit, I mean body armor, a helmet, additional munitions, that sort of thing. And I neglected to mention – I should have mentioned from the top that the attackers, when they came through the gate, immediately torched the barracks. It is aflame, the barracks that was occupied by the 17th February Brigade armed host country security team. I should also have mentioned that at the very first moment when the agent in the TOC seized the people flowing through the gate, he immediately hits an alarm, and so there is a loud alarm. He gets on the public address system as well, yelling, “Attack, attack.” Having said that, the agents – the other agents had heard the noise and were already reacting. A third group of attackers tried to break into the TOC. They pound away at the door, they throw themselves at the door, they kick the door, they really treat it pretty rough; they are unable to get in, and they withdraw. Back in Building C, where the Ambassador is, the building is rapidly filling with smoke. The attackers have exited. The smoke is extremely thick. It’s diesel smoke, and also, obviously, smoke from – fumes from the furniture that’s burning. And the building inside is getting more and more black. The Ambassador and the two others make a decision that it’s getting – it’s starting to get tough to breathe in there, and so they move to another part of the safe haven, a bathroom that has a window. They open the window. The window is, of course, grilled. They open the window trying to get some air in. That doesn’t help. The building is still very thick in smoke. At this point, the quick reaction security team and the Libyans, especially the Libyan forces, are saying, “We cannot stay here. It’s time to leave. We’ve got to leave. We can’t hold the perimeter.” So at that point, they make the decision to evacuate the compound and to head for the annex. The annex is about two kilometers away. My agents pile into an armored vehicle with the body of Sean, and they exit the main gate. Here it’s a little harder to understand because I don’t have a diagram that you can show – that I can show you. But in a nutshell, they take fire almost as soon as they emerge from the compound. They go a couple of – they go in one direction toward the annex. They don’t like what they’re seeing ahead of them. There are crowds. There are groups of men. They turn around and go the other direction. They don’t like what they’re seeing in that direction either. They make another u-turn. They’re going at a steady pace. There is traffic in the roads around there. This is in Benghazi, after all. Now, they’re going at a steady pace and they’re trying not to attract too much attention, so they’re going maybe 15 miles an hour down the street. They come up to a knot of men in an adjacent compound, and one of the men signals them to turn into that compound. They agents at that point smell a rat, and they step on it. They have taken some fire already. At this point, they take very heavy fire as they go by this group of men. They take direct fire from AK-47s from about two feet away. The men also throw hand grenades or gelignite bombs under – at the vehicle and under it. At this point, the armored vehicle is extremely heavily impacted, but it’s still holding. There are two flat tires, but they’re still rolling. And they continue far down the block toward the crowds and far down several blocks to the crowd – to another crowd where this road t-bones into a main road. There is a crowd there. They pass through the crowd and on – turn right onto this main road. This main road is completely choked with traffic, enormous traffic jam typical for, I think, that time of night in that part of town. There are shops along the road there and so on. As the night goes on, a team of reinforcements from Embassy Tripoli arrives by chartered aircraft at Benghazi airport and makes its way to the compound – to the annex, I should say. And I should have mentioned that the quick reaction – the quick reaction security team that was at the compound has also, in addition to my five agents, has also returned to the annex safely. The reinforcements from Tripoli are at the compound – at the annex. They take up their positions. And somewhere around 5:45 in the morning – sorry, somewhere around 4 o'clock in the morning – I have my timeline wrong – somewhere around 4 o'clock in the morning the annex takes mortar fire. It is precise and some of the mortar fire lands on the roof of the annex. It immediately killed two security personnel that are there, severely wounds one of the agents that’s come from the compound. So that’s the end of my tick-tock. MODERATOR: Great. Thank you so much. Given the length of that tick-tock, I would just ask before we turn it over to questions that you keep your questions very concise. And again, a reminder that this is an on-background briefing. So, Operator, go ahead and open it up for questions. OPERATOR: Certainly. Ladies and gentlemen, if you would like to ask a question, please press * then 1. You’ll hear a tone indicating you’ve been placed in queue, and you may remove yourself at any time by pressing the # key. If you are using a speakerphone, please pick up the handset before pressing the numbers. Once again, if you have a question, press * 1 at this time. And we will limit you to one question, and you may re-queue after that. It’ll be just one moment. OPERATOR: The next question is from the line of Michael Gordon with the New York Times. Please, go ahead. QUESTION: Yes. Could you tell me, please – and I know you mentioned this – when was the Tripoli reinforcements requested? How long did it take them to get to Benghazi, how many of them were there, and did it represent all of the available security personnel from Tripoli? SENIOR STATE DEPARTMENT OFFICIAL NUMBER TWO: The calls were made to Tripoli at the moment that the – at the same time the agent in the TOC sounded the alarm and then proceeded to make calls. I’m not going to go into any details about the number of security personnel who moved. OPERATOR: The question is from the line of Eli Lake, with Newsweek’s Daily Beast. Please, go ahead. QUESTION: Hi, thanks so much for doing this. Do you have any response from the charge from Erik Nordstrom, the Regional Security Officer who left this summer, who is set to testify tomorrow to say that it was a mistake to begin to normalize security operations and reduce security resources in accordance with an artificial timetable? That’s from a letter he sent earlier this month to the oversight committee. SENIOR STATE DEPARTMENT OFFICIAL TWO: I don’t know what Erik is going to fully testify on tomorrow. That’s something that will come out in the hearing. We could have a different discussion about all the security measures we had taken, but that’s a different question. MODERATOR: Okay, next question, please. OPERATOR: The next question is from the line of Margaret Brennan, CBS News. Please, go ahead. QUESTION: Hi, thanks for doing this. The timeline here begins around 8:30 p.m., but we had heard in response to some reports where reporters had found paperwork documents on the grounds of the compound that secure materials, that confidential paperwork had actually been secured earlier in the day, therefore there wasn’t any compromised material found at the compound. When did that occur? At 8:30 at night? When were those documents secured or shredded or burned or whatever? SENIOR STATE DEPARTMENT OFFICIAL TWO: Because of the – this was a post and not a – and we – this post held no classified documents. They had computer communications with Washington, but the material would arrive on the screen and you would read it on the screen, and then that was it. There was no classified paper, so there was no paper to burn. MODERATOR: All right, thank you. Next question, please. MODERATOR: Okay, thank you. We’re ready for the next question, please. OPERATOR: The next question is from the line of Toby Zakaria with Reuters. Please, go ahead. QUESTION: Hi. Do you know what the threat level for Benghazi was the day before the attack? And also, did anyone suggest to the Ambassador that it might not be prudent to go to Benghazi on 9/11? SENIOR STATE DEPARTMENT OFFICIAL TWO: Taking your questions in reverse order, ambassadors travel, ambassadors must travel, ambassadors must get out and meet with a variety of individuals, especially in countries that have multiple centers of energy or power. That’s just – it just must happen. But secondly, as Official Number One said earlier, the Ambassador did events in the city on the 10th. He had plans to do events in the city later in the week. But on the 11th, he remained in the compound. As in terms of the – of any kind of security threat, the – both ODNI spokesman and the DNI have been correctly quoted as saying that there was no actionable intelligence of any planned or imminent attack. MODERATOR: Okay. Thank you. Next question, please. OPERATOR: The next question comes from the line of David Lerman with Bloomberg News. Please go ahead. QUESTION: Hi. 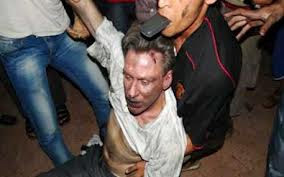 Did the Ambassador – before the attack, did the Ambassador request that security be increased in Benghazi? And if so, did anything ever come of it? SENIOR STATE DEPARTMENT OFFICIAL NUMBER TWO: The – when the Ambassador traveled to Benghazi, he traveled with two additional security agents over and above the complement of three who were assigned to post. So there were five agents with him there rather than the two who are normally assigned there – the three who are normally assigned. So they were up two. OPERATOR: The next question comes from the line of Jo Biddle with AFP. Please go ahead. QUESTION: Thank you very much. The two people who died in the compound – in the annex, excuse me – were they part of the five security agents you’ve mentioned, or were they separate to that? And how many people did you have to evacuate that night from the annex? SENIOR STATE DEPARTMENT OFFICIAL NUMBER TWO: Because – since unfortunately we couldn’t fit everything on one compound, we had two – the principle compound and the annex. We had – therefore, had our security professionals divided between the two compounds. MODERATOR: Okay. Thank you. Time for just a few more questions. OPERATOR: The next question comes from the line of Jonathan Karl with ABC News. Please go ahead. QUESTION: Yeah, hi. Just two quick follow-ups – I want to be clear on one thing. You said as soon as they heard the noises outside, they went to look and saw armed men assaulting the compound. That was the very first thing that they saw after hearing the noise outside? SENIOR STATE DEPARTMENT OFFICIAL NUMBER ONE: They heard noises, firing, and an explosion. The agent in the TOC looked at his camera and saw people coming through the front gate. MODERATOR: Sorry, we’re trying to keep it moving along here. OPERATOR: -- from the line of Kim Ghattas with BBC. Please go ahead. QUESTION: Yes, thank you for taking the call. I just wanted to clarify a little bit whether – with the rundown that you just gave us, whether it is possible to now say clearly that this was very much a preplanned attack, and if so, whether you can explain why there was no actionable intelligence. SENIOR STATE DEPARTMENT OFFICIAL NUMBER TWO: This – that subject is now under review by both the FBI and potentially the Accountability Review Board based on whatever information the FBI or the intelligence community collects. MODERATOR: Right, okay. Thank you. Just a couple more questions. OPERATOR: The next question is from the line of Shaun Waterman, Washington Times. Please go ahead. MODERATOR: Shaun? Let’s go to the next question, and maybe Shaun can go next. Maybe he’s not off mute. OPERATOR: The next question is from Dion Nissenbaum with Wall Street Journal. Please go ahead. SENIOR STATE DEPARTMENT OFFICIAL NUMBER ONE: It started after they arrived and went on intermittently for several hours. MODERATOR: Okay. Thanks. I think we have one more question, then. Time for one more question. OPERATOR: Certainly. Our next question is from the line of Chuck Todd, NBC News. Please go ahead. QUESTION: Can you at least explain the process by which if a request for more security comes in, how that’s – how you go about determining resources, so in the instance of the reports that more security was requested by the folks in Libya, can you sort of walk through how that process works? SENIOR STATE DEPARTMENT OFFICIAL NUMBER TWO: Certainly. The – this is sort of an iterative process, a discussion between the field and Washington, back and forth; the field identifying what their needs are, Washington working very, very closely with them. We always attempt to mitigate our risk. We cannot eliminate them. Sometimes the post – any post in the world might come in and say, “We need A, B, and C,” there would be a dialogue, and instead of sending them A, B, and C, we would send them B, C, and D because in this discussion process, we go to functionality, and when we determine the functionality that gets us the maximum – a maximum possible security, then we – that is what we deliver to the post. MODERATOR: Okay. Thank you. I feel like I just ignored Shaun. I know you dropped off. If you’re still on, you get last chance here, buddy. OPERATOR: And our last question does come from Shaun Waterman, Washington Times. MODERATOR: Yes, Shaun. Go ahead, buddy. QUESTION: Oh, hey. Okay. Thanks, man. So could – I mean, just in view of what you are now saying about the attack and the intensity of it and the numbers of people involved, what – can you say what kind of security presence might have been needed to repel an attack like that? I mean, what – I mean, if the criticism is there wasn’t enough security, how much would you have needed to protect the compound from this attack? MODERATOR: Okay. Thank you, and glad we got that question in. Thanks to all of you for joining us so late this evening. We do appreciate it, and we will keep in touch with all of you as we move forward. Again, thank you. 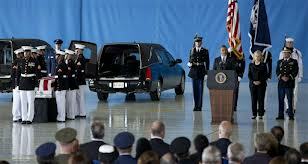 10/15/2012 6:30 CST Hillary Clinton just took blame for Benghazi Deaths. "I'm responsible for the State Department, for the more than 60,000 people around the world," she said. "The decisions about security are made by security professionals. But we're going to review everything to be sure we're doing what needs to be done in an increasingly risky environment." "I can't speak to who knew what," she said. "We knew there were security breaches and problems throughout Libya. That's something that came about as the aftermath of the revolution to topple Qaddafi, with so many militias formed, so many weapons loose. ... It was taken into account by security professionals as they made their assessments." It is all fine and good for Hillary to take responsibilities at State. She should be calling on Deputy Assistant Secretary of State Charlene Lamb's resignation and the resignation of Under Secretary of State Patrick Kennedy a result of their bad judgement that was exposed during their Testimony in front of the House Committee on Oversight and Government Reform. Lost in all the blur of all of this disinformation is what was going on with the NSC which is charged to insure that the Whitehouse and President are not caught off guard by happenings at the Department of State, Central Intelligence Agency and Department of Defense. 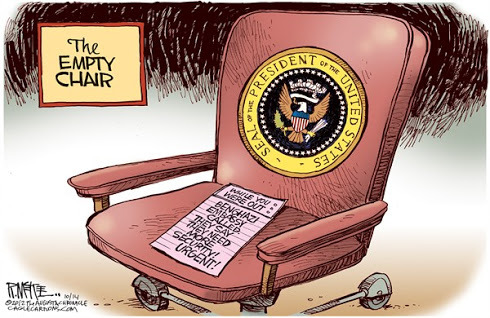 How is it exactly, and when was Obama reportedly awakened told and when did he go back to bed. The next day he headed to Las Vegas for a fundraiser. I also am more than curious to know what rocket scientist in the bowels of the Whitehouse with a brain smaller than an amoeba devised the storyline of an obscure YouTube made by a Coptic Christian that no one watched. And why this man was blamed or the protests worldwide and jailed for exercising free speech. During the 5-6 hour attack not one guided munition was fired at the Consulate. Our guided weapon munitions are deadly accurate nearly to the point of being capable of striking a hair on a tic turds back side. The question remains at least for this voter, is why was the US relying on the February 17th Brigade of Radical Muslims who were part of the force that overturned Quadhafi. This article by Stephen F. Hayes at the Weekly Standard raises many of the questions this voter would like answered. He closes with these comments: "After all, is it conceivable that White House officials at the highest levels were not actively engaged in inter-agency meetings to determine what happened in Benghazi? Is it conceivable that intelligence officials, knowing there was no evidence at all of a link between the film and Benghazi, would fail to tell the president and his colleagues that their claims were unfounded? Is it conceivable that somehow the latest intelligence on the 9/11 attacks was left out of Obama’s intelligence briefings in the days after 9/11? It would have been a priority for every professional at the CIA, the State Department, and the National Security Council to discover exactly what happened in Benghazi as soon as possible. Is it conceivable that the information wasn’t passed to the most senior figures in the administration? No, it’s really not. And therefore, the fact that these senior figures misled us—and still mislead us—is a scandal of the first order." There are many questions that need answering, which is not particularly this Administration's strong suit. This Administration is like having your washer set on a permanent spin cycle with the top locked down, nothing ever comes out clean. Once again brilliant information, I can believe they excluded Fox news ... an absolute contradiction to "transparency". Sickens me. Thanks again for producing a great blog!